As you may have gathered by now, I’ve become a bit of a fan of this series and Volume 3 has done nothing to dissuade me. The artwork remains gorgeous and the fast-paced fun makes an excellent foil for some serious material. The volume opens by introducing readers to two new characters. This surprised me a little (isn’t the cast already big enough?) until I remembered that this was space opera. 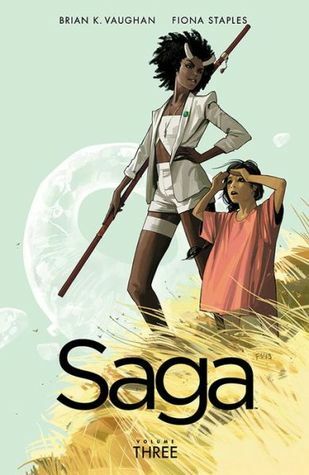 Sweeping settings and large casts are features ofthis sub-genre that Saga most definitely utilises. The introduction of new characters also balances the turnover that takes place in previous volumes. After the introduction, Volume 3 returns its focus to our heroes. The action picks up a few weeks after the death of Marko’s father and grief is a definite theme. Not only do we watch as Marko and his mother, Klara, try to come to terms with their loss, but we also get to see the effects of grief on other characters–such as The Will and Mister Heist. Each grief is a little bit different and dealt with in different ways, allowing some wonderful nuance. This volume also explores Alana’s background a bit more. I was a bit disappointed that it wasn’t given as much space as Marko’s, especially when coupled with the return of the sexualised slurs against Alana. I can only hope this treatment is building up to something that pays off later in the series. In the meantime, I found Alana’s stepmum, Even, very entertaining. Her wings were a great clue to her personality, a nice touch from Fiona Staples. I haven’t yet commented on the diversity of the series, which has been fantastic. There has been a nice balance of races and genders all the way through. This volume introduces the first explicitly gay characters and hints at the discrimination they have faced back on their home planet. I’m very much looking forward to getting to know these characters better. In my review of the last volume, I mentioned the meta commentary on reading and fandom. Volume 3 continues this entertaining commentary and even expands it to include artists and illustrators. Alana has proven herself to be very much one of my people with her vehement dislike of spoilers.